As one of the newest slots from Microgaming, Dragonz benefits from having better graphics, and a more dynamic gaming structure than most other Microgaming developed slots. Dragonz is a light-hearted take on the whole mystical dragon theme that we have seen so much of in the online slot world, and it is one which will suit fantasy players down to the ground. The slot offers a friendly, and loveable array of characters, and its features are impressive than even players who aren’t lovers of this genre may fall for the game. Dragonz contains 3D graphics, as we have mentioned. This is a still a relatively new concept for Microgaming, who prefer to employ high classy 2D graphics in most of their slots. The Dragonz slot also contains some mild animation which is sure to impress. There is an element of the familiar to the game, though, namely in the form of Microgaming’s 243 ways to win payline structure. This payline structure has proven so popular in the past, that Microgaming was never going to do away with it in this slot, which is scheduled for a November release. Dragonz contains a menu bar which is of high quality. It offers a good wagering range, and allows you to tinker with your wagering options (within the usual 243 payline parametres), while still fitting in with the overall theme of the slot. Players can wager anything from a floor of just $0.40 per spin on this slot, and maximum stake bets won’t cost you any more than $30 a spin. 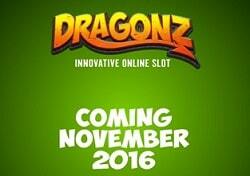 Dragonz is destined to be a very affordable slot machine game, then. Wild symbols: No Microgaming slot would be complete without wilds. In this slot, wild symbols are capable of appearing on the third reel of the game. When they do appear, they can trigger a Wild Deal bonus, which can see additional wilds spring up on the reels at random. The more wilds this feature offers, the larger your wins will be. Scatter icons: Players are going to want to land as many scatters as possible. The more scatters they acquire, the better the chance of landing the free spins feature. Flint spins: The very first time you enter the free spins bonus, you will pocket the red dragon (Flint) bonus that consists of 10 free games with Flaming Wilds, which can appear randomly on the reels. As many as 10 wilds can appear on a single spin. Switch spins: The fifth time you enter the bonus, you will trigger Switch’s bonus. Switch is the purple dragon. In this feature, you will get a Stashed Wilds feature to go with your 10 free games. With it, wild symbols can be accumulated during the feature. Once three have been accumulated, they will be chucked out across the reels on a single spin. Frost spins: Enter the bonus a few more times and you will trigger Frosty the blue dragon’s bonus. This naturally offers up frozen wilds for your 10 free games. These can slide across the reels and will remain frozen in place for the entire duration of the free spins bonus round. Gobble spins: This feature is the final free spins bonus. Gobble the green dragon can offer you another 10 free games, during which Gobble may vomit sticky wilds onto the reels of the slot. Those sticky wilds can remain for a number of spins, too. There isn’t too much difference between this and the previous bonus. The final feature is triggered when you have entered the free spins bonus round at least 25 times. It will allow you to pick your own free spins bonus feature. Microgaming has decided that the top prize in this slot is going to be worth around 3,500x your total stake. That is a pretty spiffy prize indeed, especially since the slot machine game doesn’t exactly cost you a fortune to play. Dragonz is entertaining, it offers up rich wins, and it should be available in all top Microgaming casinos come November. The theme won’t suit everybody down to the ground, but if you look past the child-friendly tone of it all, you will see that this slot is more about graphics and features than anything else.